Does your next-door-neighbor-democracy have elections coming up, but you are not convinced that they will make a choice that best benefits your country? Don’t worry! Interference in democratic election processes is widely used tactics to get your most-favored candidate to power without caring about international principles such as ‘equal sovereignty’ or ‘par in parem non habet imperium’. These tactics are available for you as long as you regard yourself as an objectively superior nation in comparison with everyone else. Furthermore, if you are of the opinion that although ‘power by the people’ is admittedly a catchy phrase, but when it comes to choosing the right candidates to rule, it is rather an inconvenient hindrance; this basic course is perfect for you! Curious to know how such a partisan electoral intervention could be realized? Read below the best trips and tricks to achieve the most effective kind of interference. 1. Follow the big bucks! Choosing the most suitable candidate for you is not free. More important than quantity however, is how the money gets used. 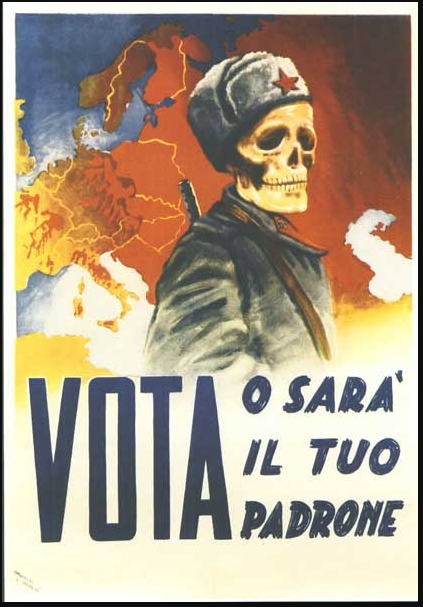 For example, in the 1948 Italian General Elections the Democrazia Cristiana won with a clear majority, partially thanks to the CIA who did not only invest money directly into the campaign, but also wrote ten million letters, broadcast radio programs and published books and articles with warnings about the consequences in the event of a communist victory. The competing Partito Comunista Italiano was supported by the Soviet Union who could not however answer to such systematic and strategic interference. 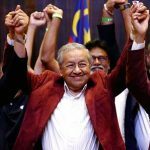 Moreover, foreign investment is not restricted only to states but as aconsequence of increasingly more open global financial markets, billionaires and banks can now play a significant role in funding foreign elections as well. For example, the American billionaire, Sheldon Adelson, funds a free, pro-Netanyahu newspaper in Israel whereas a Czech Russian Bank in Moscow lent over 9 million euros to the political party ‘Le Front National’ in France. 2. Instead of overt, go covert! 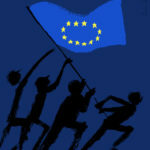 If you believe that an overt interference, like the ones mentioned in the examples above, would deteriorate your reputation in the face of the international community, you can opt for a more implicit solution! In the Russian presidential elections of 1996, the United States, hoping to see Boris Yeltsin get re-elected despite his sunken popularity, backed a massive IMF loan of over 10 billion dollars for Russia. Even though the US denied the political nature of this loan, Yeltsin used it shamelessly to promote his own political standing by declaring the loan as a declaration of trust by the international community. In the end, Yeltsin was able to hold on to his post for some time more whereas links to the US were less overt and easier to deny. Thus, in conclusion, framing an intervention as an international, generally accepted decision, is truly a subtle way to get effective results! In the modern world, you no longer need to send out tens of millions of propaganda letters as we saw the CIA do in Italy. As the most recently revealed foreign electoral interference – Russian influence in the US presidential elections in 2016 – shows us, social media is the new major platform to fight for influence. Online political advertising if anything, is a prime example of a covert way of influence. Even though troll armies are known to exist, their location and funders remain a mystery. Through data analysis it has been inferred that the trolls were able to target a third of the American population through advertisements on Facebook. The beauty of this strategy is that with a relatively small sum, significant percentages of populations can be reached. Furthermore, as the Internet is still seen somewhat a depoliticized arena, it is a textbook example of hidden interference. But do the partisan electoral interventions truly have an impact? A study by Dov H Levin shows that between 1946 and 2000 the USSR/Russia and the US were able to increase the voting percentage of their favoured party by approximately 3 per cent per election – a significant increase if the election is an even one. If added together, from 1946 until 2000 these two countries influenced every ninth competitive elections worldwide – that is 117 elections in total. Therefore, it must be concluded that you as well, with a relatively small effort and appropriate funds, can potentially have a huge impact on world politics! 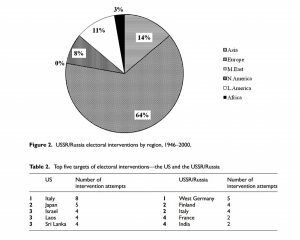 Partisan electoral interference is not just a mere Russo-American playing field, but other great powers such as China, Iran and Saudi Arabia are heavily involved, even though the data on their covert interference is not as accessible as that of the first two. More generally, the popularity of an overt interference has significantly decreased over the years as it is a costlier way to gain influence, both with regard to the political and financial consequences. 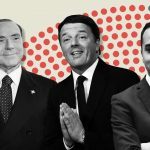 Today, half of the countries in the world have some form of competitive elections, which further facilitates the covert influence over the domestic politics of other states. This is remarkable since these types of interventions constitute an attack against our perception of democratic institutions, allegedly an expression of an opinion of the nationals, but simultaneously a target of foreign power influence. The more embedded the foreign electoral influence is in the money flows, power structures of the international society and Facebook algorithms, the more naturalized it becomes. In conclusion, more research is needed in order to deconstruct the extent of opinion influencing by partisans. Namely, only this way the parameters of our democratic systems can truly be understood and hopefully transformed more neutral in the future. 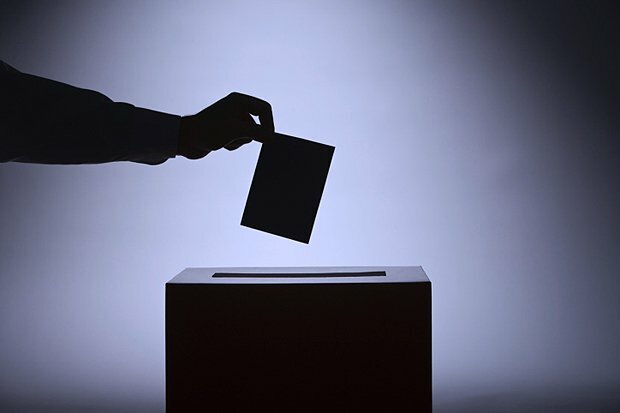 If you are interested to read more about electoral interference and how data on covert attacks has been gathered, check out Dov H Levin’s article ‘Partisan electoral interventions by the great powers: Introducing the PEIG Dataset’ (on SmartCat)!